Is the 4% Rule of Retirement Still Good Advice? The 4% rule is a well-worn rule of thumb for retirement. Does the rule still hold up in our topsy-turvy post-crisis world? The 4% rule is a popular rule of thumb according to which retirees can withdraw 4% of their capital in their first year of retirement and adjust that amount for inflation annually. Under that rule, an investor's retirement savings will provide a 30-year inflation-adjusted annuity, as it were. However, the post-financial crisis era is, in many respects, uncharted territory (think negative bond yields, for example). So, is the 4% rule still good advice? We put the question to three of our Foolish analysts. The 4% rule was devised in 1994 by Bill Bengen, an MIT aeronautical engineer turned financial planner. Bengen assumed a portfolio evenly split between bonds and stocks and tested to see whether the paycheck would last through every 30-year period beginning in 1930; the 4% rule held up in all cases. Nevertheless, Bengen himself told The New York Times last year: "I always warned people that the 4 percent rule is not a law of nature like Newton's laws of motion," adding that "[i]t is entirely possible that at some time in the future there could be a worse case." Furthermore, the current combination of historically low interest rates and elevated stock valuations has the potential to test the limits of the 4% rule. Are we in the "worse case" Bengen refers to? It's impossible to determine beforehand, but if we are, it'll be too late to make adjustments once we know for sure (i.e., after the fact). As such, I think the 4% rule is a good starting point, but investors should aim to get by on smaller withdrawals. U.S. Long-Term Interest Rates data by YCharts. And unless you've been living on a non-internet-connected desert island for the past decade, this isn't news to you. But there's more to making sure your retirement savings will generate sustainable income. 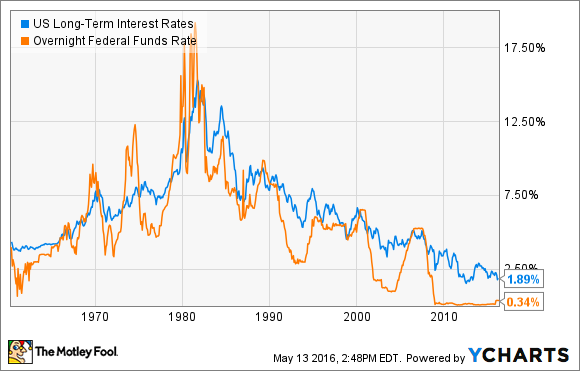 As Bill Bengen himself wrote a few years back, it's not just about interest rates. He wrote, "Historically, a portfolio has 'blown up' prematurely almost always because of dire investment returns and/or inflation that struck in the early years of retirement." Think about it this way. If you retire this year and take 4%, and then the market falls substantially next year and stays down for several years, you may need to consider taking a smaller distribution simply to preserve more of your capital. Otherwise, a prolonged downturn may eat away at too much of your retirement savings so early in your retirement. In other words, the bigger risk to your portfolio is how you adapt to changing environments. Bengen himself has said as much. Is the 4% rule still good advice? My answer is no. It's a general rule of thumb, but not a Rule That Must Be Followed. If you have absolutely no idea how much you might be able to withdraw from your nest egg each year in retirement, it can give you a rough starting point. But follow it rigidly and unquestioningly, and you might run into trouble. Why? Well, remember that each of us has different financial situations and needs, and every year in the stock market is different, too. If you plan to follow the rule and withdraw 4% of your nest egg in your first year of retirement, what if the stock market and your portfolio tank by 30% in the year leading up to your retirement? (Such things can happen -- the S&P 500 sank by 37% in 2008.) As a simplified example, imagine that you had a $100,000 nest egg before the drop, and you'd been planning to take out $4,000 in the first year, leaving $96,000 to keep growing for you. If you suddenly have only $70,000 and still want to take out $4,000, you'll be leaving your nest egg even smaller, at $66,000. Take out 4% of the $70,000 instead -- $2,800 -- and you'll be left with $67,200. This state of affairs will leave you with much smaller 4% withdrawals or fewer years of bigger withdrawals. Your lifespan is another factor that can make the 4% rule less useful. It's meant to give your nest egg a high probability of lasting 30 years for you. But what if you retire at age 62 and live another 40 years to age 102? The rule is also often based on the assumption that your portfolio is split 50-50 between stocks and bonds. Your own portfolio might not look anything like that. Go ahead and consider the 4% rule if you want, but crunch your own numbers to see what kind of withdrawal rates make sense for you and your retirement. I think using the 4% rule as a general guideline is still a good idea for most investors. However, before you start blindly start making withdrawals, you need to be aware of the rule's limitations. To me, the biggest problem with relying on this calculation is that it assumes historical market returns will continue into the future. While I'm by no means a market bear, I have a hard time believing the next decade will produce returns similar to historic levels. My concern stems from the fact that interest rates are still near historic lows, and at the same time, the stock market is trading for a premium multiple. That makes me believe an investment portfolio with a reasonable mix of stocks and bonds could have a hard time providing strong enough returns over the next decade to allow the 4% rule to function properly. For that reason, I think investors who want to retire today should do their best to build as much flexibility as possible into their financial life. One way to do that is to keep a large cash balance so living expenses can easily be met during periods of market turmoil -- even if you are using the 4% rule as a starting point for your retirement spending.